This is my last zero of this summer. It’s hard to believe I’ve been hiking nearly everyday (with a few breaks) since the end of March! My body is holding up very well, but mentally, I’m ready to REST! The endurance of blogging each day is many times more draining than the hiking, ha! Again, I don’t know where the time goes in town. I feel like I could use a week of zeros to get done what I’d like, but I have to accept that I don’t have enough time. I am well behind on my emails and will catch up after the hike. I did however, get to catch up with many of my friends and family today and that took priority over the blog stuff I guess. The day just slipped away and I keep telling myself that’s ok. If I keep repeating it, maybe I’ll believe it. 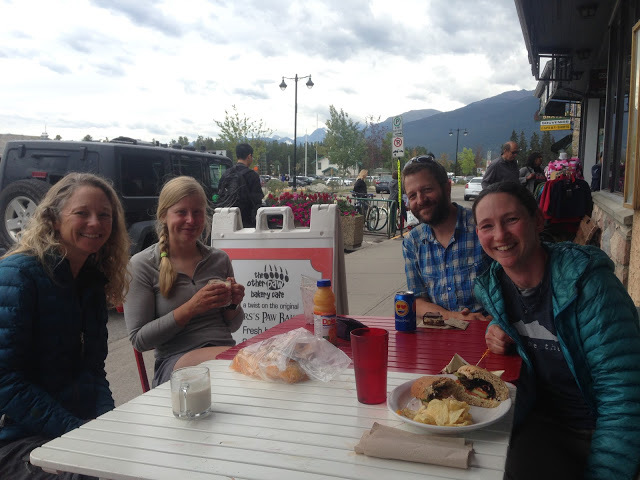 My one photo today is that we did get out and meet Gian and Laura at the popular bakery shop called The Other Bear’s Paw Bakery (down the street from the Bear’s Paw Bakery). Good to see them again. Their hike will finish at the common terminus of Mt Robson in four days and we will most likely all reunite there to congratulate them on completing their hike. From Mt Robson, E and I will continue on up another 9 days to the more remote and lesser traveled terminus of Kakwa Lake. Less people do the trail all the way up to Kakwa Lake because it is so remote, there is less beta on this area, there is a lot of overgrown, and it can be a more difficult place to hitch from at the end. We fortunately have a ride arranged and are very excited about that. I’m mentioning all this now because I don’t know if I’ll get strong enough service to post again before we make it up to Kakwa Lake in two weeks. Just a heads up to everyone that it may be up to two weeks before a new post goes up and that is nothing to be concerned about. As always our progress can be viewed on the “Where’s Wired” tab at the top of the blog.